Tingo Maria is a hot and humid city in the selva alta, the high jungle zone in which the eastern foothills of the Andean range descend and disappear into the dense jungles of the Amazon Basin. It’s an energetic city despite the heat; the 60,000 or so inhabitants seem to be in constant motion, buzzing around in mototaxis or walking up and down the city’s central thoroughfare. Street vendors and market stall owners go about their business with cries and shouts aimed at passersby, while students from the local universities help give the city its more youthful and vibrant side. Tingo has never been a prime destination for foreign tourists. It was largely isolated until the early 1940s, after which it was altogether avoided during the 1980s and early 1990s due to Shining Path activity in the region. 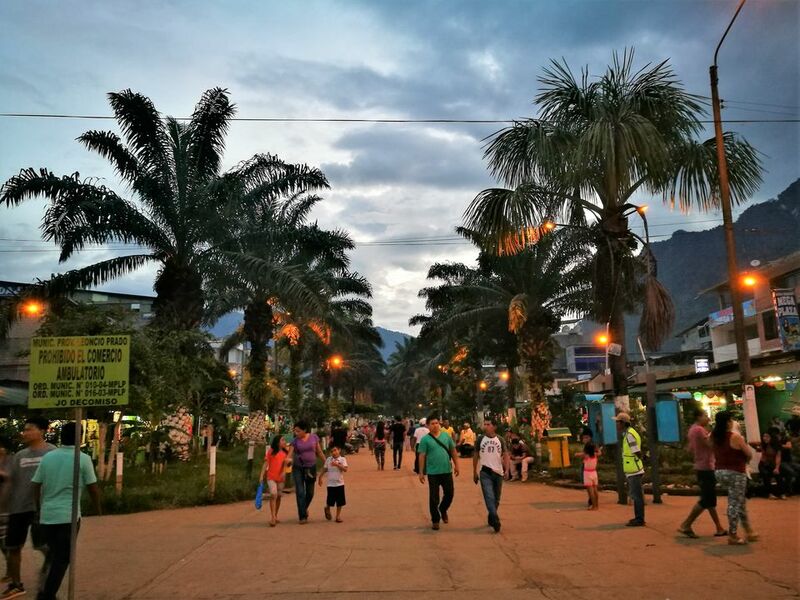 The city still struggles to shed the remnants of its tarnished reputation, in no small part due to the continued presence of drug trafficking operations in the Upper Huallaga Valley. The city, however, is relatively safe and Peruvian and international tourists are heading to Tingo in increasing numbers, thanks largely to the flora, fauna, and scenery of Tingo Maria National Park. The city itself won’t charm everyone, but the surrounding hills—their densely vegetated and cloud-topped forms rising up all around the city—are ripe for exploration. Tingo Maria is small and easily navigated on foot. The Rio Huallaga runs along the city’s western flank, providing a good point of reference. There really isn’t much to do in the city itself, perhaps explaining the constant stream of pedestrians along La Alameda Perú, the main street running through Tingo. Groups of friends, families and cuddling couples walk up and down the thoroughfare—especially during the evening and at night—chatting, laughing, and constantly bumping into other friends and acquaintances. Bands, dancers, and other performers sometimes set up on or near the main square (half way along Alameda). Tingo Maria’s main market is located at the southern end of the street, selling everything from socks to soups. Head a little further south and you’ll arrive at the botanical garden, home to more than 2,000 different types of tropical plants. If you’re looking for regional street food, head north along Alameda until you see a row of grills on your left. Here you’ll find tasty grilled chicken, local fish, and regional specialties like juanes, cecina, and tacacho. Few restaurants really stand out from the crowd. There are some passable cevicherias (ceviche), one or two decent chifas (Chinese), and plenty of nondescript eateries selling regional dishes and chicken. For excellent grilled meats, head to El Carbón (Av. Raymondi 435). For nightlife, take another stroll along Alameda. You’ll find a few bars, some of which are bordering on trendy while others look downright seedy—a quick glance is normally enough to judge the vibe inside. You’ll find a handful of fun and frivolous discotecas on or near the main street, including La Cabaña and Happy World. There’s a decent selection of budget hotels in Tingo Maria, but don’t expect hot water. Hostal Palacio (Av. Raymondi 158) is an affordable and reasonably secure option right in the center of the city, with plenty of rooms surrounding a central courtyard. Head one block down the street and you’ll find Hotel Internacional (Av. Raymondi 232), a slightly more expensive option that lacks charm but offers cleanliness, security and hot water. A higher-end option is Hotel Oro Verde (Av. Iquitos Cuadra 10, Castillo Grande), located a short mototaxi ride from the city center. With its pool and restaurant (both of which are available to non-guests), Oro Verde is a veritable oasis compared to Tingo’s bustling central streets. Just to the south of Tingo Maria lies the beautiful and easily accessible Parque Nacional Tingo Maria (Tingo Maria National Park). Here you’ll find the famous Bella Durmiente (Sleeping Beauty), a range of hills that, when seen from the city, has the appearance of a sleeping woman. Also within the park is La Cueva de Las Lechuzas (Cave of the Owls), home to a colony of nocturnal guácharos (oilbirds, or Steatornis caripensis). The oilbirds, alongside bats and parrots, swoop among fascinating formations of stalactites and stalagmites in the darkness of the cave. Take a flashlight if you have one, but only use it to see where you’re stepping; pointing it directly at the nesting birds disturbs the colony. Other surrounding attractions include numerous waterfalls and water features, such as La Cueva de Las Pavas, a ravine where families gather to spend the day beside the crystalline waters, and the Velo de Las Ninfas waterfall. Many more caves, waterfalls, and swimming spots are dotted around the nearby area; you can hire an official guide in the city center to show you the sights. In October 2012, LCPerú—one of the smaller domestic airlines in Peru—​began a daily service between Lima and Tingo Maria. This is currently the only scheduled passenger flight between Tingo and the capital. Frequent buses run between Tingo Maria and Lima (12 hours), passing through Huánuco (about two hours from Tingo) and the high-altitude city of Cerro de Pasco. Top-end bus companies such as Cruz del Sur and Ormeño do not make the trip all the way to Tingo. Companies that do make the journey include Bahía Continental and Transportes León de Huánuco (both of which are bearable—Bahía currently gets our vote). From Tingo, you can push further east into the low jungle to Pucallpa (about 5 to 6 hours in shared taxi, slightly longer by bus) or further north to the high jungle city of Tarapoto in San Martin (8 to 10 hours). Both these overland routes have dubious reputations due to drug trafficking and robberies, so travel with caution. It’s always a good idea to travel with a reliable car company along these routes.